It seems that every time gas prices go on the rise here in the United States, sooner or later sightings of Geo Metros increase along with those owners that can’t leave well enough alone and insist on trying to eke out even more MPG’s. This second generation Canadian-built Geo Metro (1995-1997, 1998-on rebadged as a Chevy), I’m guessing it’s a 1996, was rated at 37city/44hwy with the 1.0-liter 3-cylinder engine paired with the 5-speed manual transmission. Back then, in the pre-hybrid age, this was fantastic for a “modern” car that while extremely basic, wasn’t anywhere near the hair shirt that the prior generation Metro was. But all that still isn’t good enough for some people once gasoline prices rise, currently approaching $3/gallon for regular unleaded here in Colorado. Wow. There was the Honda Insight, so would this be the Geo Damnsight? As it it goes a damnsight farther on a gallon of gas than a regular Metro? I might suggest that his next step would be to seal and fill all body seams on the passenger side. Who needs two doors when gas costs this much, right? Other than keeping my tires at 35-36 psi and not driving like A. J. Foyt, I don’t do anything special. Always love to see this generation Metro. I designed the fixture that held the door while the hinges were attached to the car. Well, the door still appears to be attached so it looks like your fixture allowed the assembly to proceed as desired. You shall be awarded the cake. Your whole career hinged on that one design, Doug! What do I do to increase the MPG on my 32 year old Plymouth with a 318 V8? Or let it run out and then push it for the last mile. $3 a gallon!!?? I’m jealous, it’s pushing $4 here in California, over $4 in more remote areas of the mountains. Good news, it’s encouraging me to ride my motorcycles more. And speaking of motorcycles, I worked with a guy (in a pretty senior management role for a big company) who was a former amateur motorcycle racer, rode a high performance street bike, and had a handful of Geo Metro’s as daily drivers and backup parts cars. There was a major explosion at the Irving Oil Refinery in St. John, New Brunswick this past week. It is Canada’s largest refinery. Prices are expected to rise in Northern New England as a result. I would bet the impact will be felt even further. Yep, the warnings are already being printed. He’s so streamlined he’s probably still on the same tank of gas from 2006. Perhaps this driver’s going for higher top speed rather than increased mileage. They’re obviously part of the feared underground Metro racing circuit. Here in ChicagoGaryland when a Geo falls into a pothole they just leave it there because it fills up most of the hole. And cheaper than fill too. This reminds me of a couple things. The first is how the second generation Prius, while having extremely good timing of being introduced around the dramatic run-up in gas prices during Hurricane Katrina, came with an oddly shaped roof, specifically designed for aerodynamics. I can’t imagine the effort being worth more than a fraction of a single mpg. Plus, it meant that the Prius could not have any type of sunroof. The other is an old McDonald’s commercial touting their ‘Super-Size’ upgrade which featured some sad-sack being given a Metro hatch as a rental car. Except, in the commercial, it was called a ‘Speck’. Of course, we now have the Chevy ‘Spark’. I wonder if someone saw that commercial and that was the inspiration for the name. Personally, I prefer the name ‘Spork’. While I don’t much like the last generation sedans, I always kind of liked the Geo Metro 3-door in an elemental sort of way, a latter-day Chevette. While not much fun to drive, they’re another one of those cockroaches-of-the-road that seem to keep going forever, no matter how hard the owner tries to kill it. It’s always interesting to read about US gas prices. In Uruguay, gas is 1.70 a liter right now, which would add up to 6.40 a gallon. Now, the price by itself doesn’t mean that much, because it should be compared to something else. Average national income? Not a good indicator, as I should also point out the percentage of people owning a car. But, to try and compare, an Indian-made Suzuki Swift 1.2 list for 15 K, and a basic Chinese BYD F3 (a 2004 Corolla look-alike with a 1.5 engine) for around 13 K.
Even though they are cars for a very broad customer base, simplistically I’d say many of them are bought on 5-year loans by families with a gross income of less than 36K annually…which is solid middle class. Add up an annual road tax that’s 4.5% of the list price, plus around 1.5K for insurance, and you are all set to drive off the dealer’s. If you happen to live in Montevideo, slow traffic will easily add 50% to your fuel consumption. In my daily driving, my 2017 Renault 1.6 will sometimes drop from 30 mpg to less than 20. Our Saipa 111 returns 55 mpg on highway and still a lot of people complain and gas is 10 cents per Litre down here. From what I see, the Saipa 111 is a late ’80s Kia Pride. They were sold here in the ’90s as the Ford Festiva with excellent results, there are lots of 25-year-old Festivas with really nice interiors. It’s amazing how long older models keep being produced for us, Third World citizens. There’s a guy – in Seattle, I think – who went further with the streamlining on one of these. 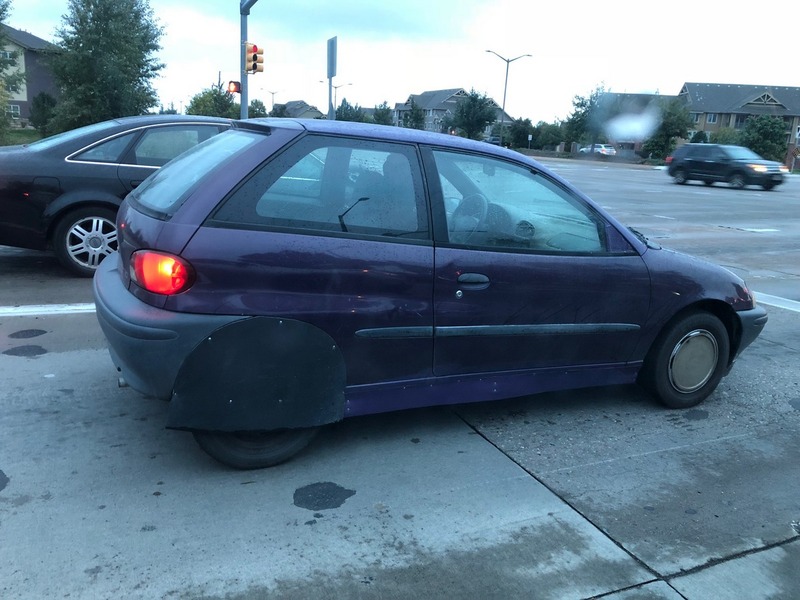 He cribbed up side mirrors that fit on the inside of the door. They apparently worked fine, too. He was quite proud of the 50+ MPG he was getting. I loved my ’95 Geo Metro and probably the car I owned the longest. But let’s be serious its a coke can with an engine. I never really felt safe in it. I loved how cheap it was to run and it never broke down. I sold it to a teen aged kid last year for his first car so I am sure it’s trashed by now. Back when these were available new I worked with a fellow who bought one and was quite pleased with it as he drove a lot and appreciated the fuel economy. My only recollection of riding in it a time or two was it wasn’t as crappy as I thought it would be. Fuel saving . . . the biggest contributor to lower fuel economy is the brake pedal so use it as little as possible. I don’t worry about it too much because the older I get the less I seem to be driving. “Fuel saving . . . the biggest contributor to lower fuel economy is the brake pedal so use it as little as possible.” Unless you have a Hybrid and then the proper use of the brake pedal can contribute significantly to increasing your MPG. Of course the proper use is the key and that means braking at a rate that minimizes the use of the friction brakes and maximizes the use of regen braking. Looks like those skirts are just part of a rubber mat of some sort. I’m betting (hoping) those are sheet metal screws holding it on so you don’t need a cordless drill to change a tire. I went back to the original image to enlarge it further and it appears that there is no screw head of any type, i.e. flush like a rivet. It’s hard to see the detail once blown up but that’s also my recollection from when I was next to it at the light last week. Gas prices here in Dallas are averaging $2.683 per gallon according to GasBuddy. Gas prices in the U.S. are given by the gallon; to convert them to liters, you divide the price by the number of liters in a gallon, 3.78541. If I calculated correctly that’s something like 97 cents per liter. As for the teardrop-tailed Geo, that would be a lot of fun to build! Speaking of tire pressures the fact that most of my vehicles have TPMS has led me to neglect checking the pressures of those that don’t. With the vehicles that have TPMS I just plug in my scan tool and check the pressures on my phone screen.On the SUV it came with 5 matching tires and wheels so the spare has a sensor. I knew it was getting low from my regular scan tool checks. Well with a little more time and the colder weather it finally went off. Since I had to drag out the stuff to put air in the spare I checked them on the vehicles that don’t have senors. I’m a little embarrassed to admit that both vehicles would have had multiple codes if they had TPMS. I should also note that both had particularly low mpg on their most recent tanks. So hopefully that means that they will both see a noticeable improvement in the next tank. Like the look of the Geo Metro as it looks more like a car of the 1990s compared to the related 1980s-looking Suzuki Swift sold in Europe up to 2003, the only thing missing is a 5-door hatchback bodystyle and a GTI spec 1.6-litre Suzuki G engine. Streamlining doesn’t matter much below 40MPH. Geo Metros don’t go fast often enough for the fine points of streamlining to make a difference. This gadget would add a meaningful amount of weight, so it’s more likely a net loser of mileage in daily acceleration and uphill driving. To be fair, it is possible to get a Metro up to highway speeds. But why anyone would want to subject themselves to the vibration and thrashing of a stressed 1.0L three-cylinder engine just to shave a few mpgs is beyond me. And, as someone else pointed out, the weight penalty of those Rube Goldberg panels would surely negate any kind of aerodynamic gains. Could be a prelude (so to speak) to a Yaris …..
“Is there anything else that you do to try to reduce your fuel consumption (if you actually care about it)?” Coast for as LONG as possible downhill & when you know the next traffic light is red or is about to turn red. Let off the gas early when you see a STOP sign at the end of the road & begin braking GRADUALLY as you get closer to it (same for a red light). Leave the A/C off & open the window when stopped in traffic or traveling below 40 mph in the middle of summer. Remove unnecessary weight (such as unused back seats) from your vehicle & periodically check tire pressure if it doesn’t have TPMS. Drive at a consistent speed between 50 & 60 mph as often as possible when it’s legal & safe to do so. MAINTAIN YOUR VEHICLE. The absolute HIGHEST fuel economy I ever got from my Aerostar was 26.98 mpg, JUST UNDER 27 (with a 4.0L V6!) & undoubtedly enabled by driving techniques like these. Sightings of Geo Metros are inversely proportional to sightings of Hummers in relation to gas prices. Sadly the used prices of Hummers don’t drop as precipitously. I was hoping to pick one up for pennies on the dollar but no dice. I need the whole country music experience and a Camry just doesn’t have the same gravitas as a Hummer. A rollin’ coal King Ranch Ford with too sweet chrome stacks is too far out of my price range. Petrol has hit $2.50 per litre in NZ thats $11.25 per gallon, diesel isnt quite so bad at $1.45 plus road user tax, I’m still geting great fuel mileage from my C5 as is. 110 mpg at 50? Not a chance in real driving. It’s a mild hybrid, so you have to drive a substantial distance for the mileages with and without electric-assist to even out. A whole lot more than the 1.3 miles reported. Actually, the tail was tested with the hybrid system disabled — there was no assist or regen messing with the numbers. With the tail (and multiple other mods) it regularly returned 100+ MPG US in “real driving”: round trips (of several hundred km) on relatively flat terrain, taking the scenic route = 50 mph / 80 km/h limit. The Insight’s stellar highway MPG was mostly from its engine being able to run in super-efficient lean burn mode under relatively light load. So reducing aero drag expanded the lean burn “envelope” and paid big MPG dividends. It had a tired hybrid battery when I owned it, so most of the miles I put on it were with electric assist switched off to prolong the pack’s life. Honda let its engineers build a remarkable car. You are right the original Insight’s engine with its lean burn mode and the emission’s control system is the overlooked/misunderstood key to the car’s exceptional Hwy MPG. As reported by many owners when the battery pack fails and the flip the off switch they only loose about 10% overall. It pretty much is a deep R&D project that they some how slipped past the normal channels and into production. On the other end of the spectrum I discovered how to get the absolute worst possible MPG out of my ’86 gas engined 5 speed Jetta. I had a job that was 3/4 mile from home, so I decided to only drive to and from work for a tankfull to see what I would get. 15 MPG, it turns out. It also got an oil change after this experiment. I do remember these Metros coming out of the woodwork back around ’05 during the last gas “crises”, and also recall some crazy prices on Craigslist for these cars around that time. I had the Canada only 1995 Pontiac Firefly version of this car. It was a 1.3 liter 4 cylinder with an automatic, the only way you could get the 4 banger that year. I got around between 500 & 600 KM`s per tank of gas city driving only with that vehicle. It was surprisingly peppy and quite nimble. It also was great for hauling almost anything. The backseat had decent leg room for such a tiny car, although I used it mainly as a 2 seater. I kept it from 1995 until 2008. I would have kept it longer but it was getting to the point where the big ticket items were starting to break and part were expensive and sometimes hard to come by. These were great cars for what they were designed for a cheap city commuter car. The closet thing to them now is the Mazda 2. Aside from both being cheap, efficient econoboxes with triples under the hood, they also share the distinction of having a huge amount of ridicule heaped on them by conventional gearheads/autojournos, despite accomplishing their simple mission pretty well. Yeah, I don’t get the Mirage ridicule, either. When money’s tight and you want a new car with a warranty, it seems good enough. The usual argument is the same money is better spend on a 3-year old, off-lease Civic or Corolla with, say, 40k or so miles. The car that really deserved the vitriol was old, Daewoo Chevy Aveo. Now, that was a miserable shitbox. 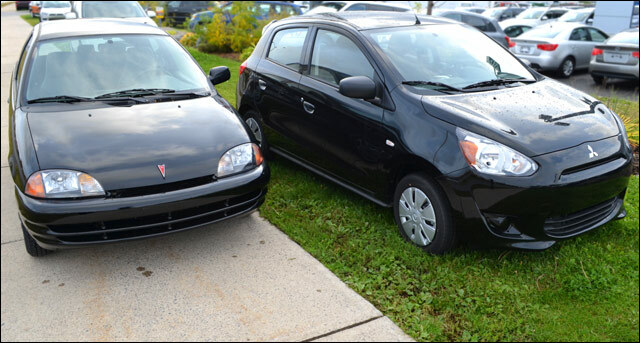 I had forgotten about the Mitsubishi Mirage. I have never seen one in person. I remember the ads in the newspapers saying you could get a new car for the equivalent amount you spend on lunch at Subway 3 times a week or your daily coffee at Starbucks. I would think that for many a brand new car with a warranty is more attractive and maybe easier to get financing on. I regularly get 40 mpg at a steady 90 mph in my 1995 Toyota Carina wagon – it has a 105 hp 1.6 liter inline-4 which does lean burn up to 4400 rpm! I paid 1200 $ for it. If I add up all costs (gas, insurance, maintenance, tires, repairs) I travel each mile I go for just below 30 cents (gas is 7.24$ a gallon in Berlin right now). In my calculation, I have not factored in the resale value of my car. As these indestructible Toyotas are always in demand in Africa, I can leave it witg Nigerian car dealer around the corner for – 1200 dollars. How is that for total cost of ownership ? I really like its style, but I wonder why Metro and the Opel Corsa B couldn’t be the same car.